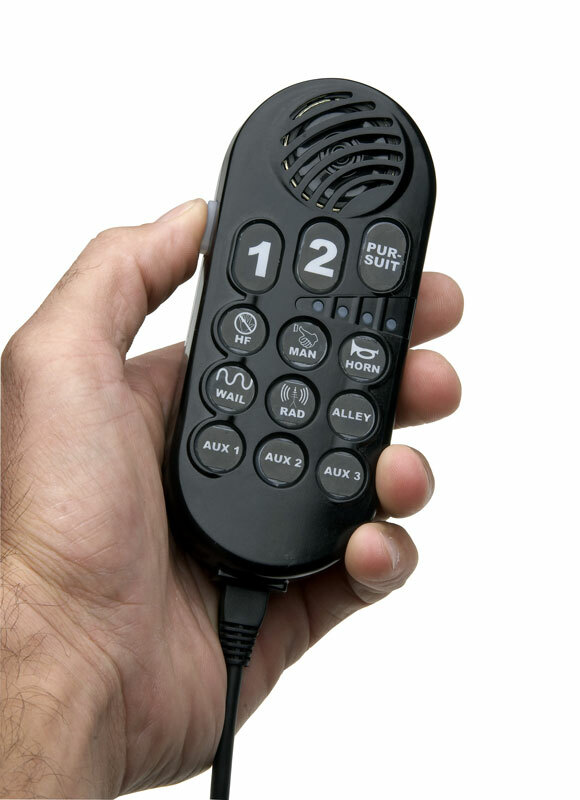 Moisture-resistant controller features twelve rubberized, backlit push buttons including progressive three-position push button lighting control that mimics typical slide-switch operations. The unit is microprocessor controlled and rated for one or two 100-watt speakers. Compact control is ideal for multiple applications including undercover vehicles and vehicles with limited interior space. 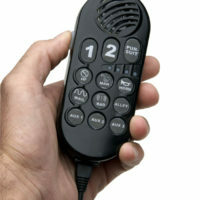 Hand held Siren/Light control with built-in microphone. 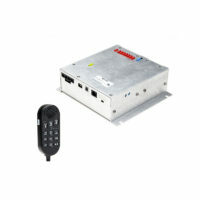 Hands-Free siren control via horn ring or foot switches. Twelve illuminated push buttons, programmable to selected outputs. Green backlighting, switch turns red when activated. Progressive three position push buttons replace slide switch for lighting control. Meets Class A requirements of SAE, AMECA, KKK1822 and California Title XIII specifications. Operates one or two 100-watt speakers. Wail, Yelp, Piercer, Manual Siren and Airhorn tones preset standard, with 37 total tones to choose from, including mechanical siren tones. All functions are programmed via simple “pick and click, or drag” screens. Windows® based, XP or later operating system required. 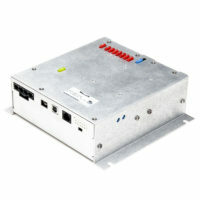 USB input from PC or laptop makes programming easy. Unidirectional microphone over- rides all siren functions. 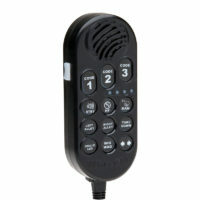 Adjustable (preset) microphone and radio repeat volume. 6’ coiled cord microphone cable. Amp/Relay module: 2-1/2” (65mm) H x 8” (203mm) W x 7” (184mm) D.
Control head: 5-5/16” (135mm) H x 2-1/4” (57mm) W x 1-1/8” (28mm)” D.